Please allow me to use Pagan mythology for a long and rambling metaphor. I spent some good time scrambling these past few days into the brain blender, churning memories over to find something I could pull out of the darkness and use to color this world. 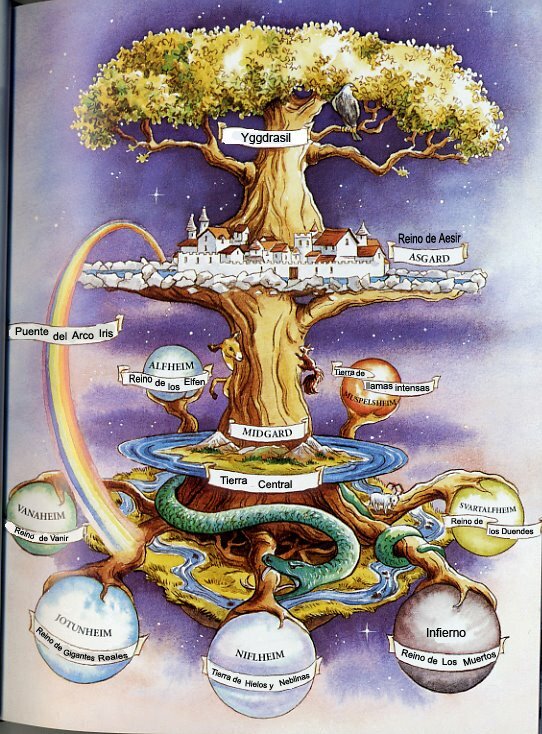 I first heard the story of Yggdrasil in a story book, written as a fairy tale, with detailed pictures of this mythical…well, myth. Yggdrasil. The towering ash tree, made up of nine worlds is central and scared in Norse mythology. In most stories of Yggdrasil, the tree has three roots. On root reaches the realms of Asgard, home of the gods, another extends Niflheim, the realm of the dead and the last grows to Jotunheim, land of the giants. At it’s base, the Well of Wisdom (Mimir), the Well of Fate (Urdarbrunnr) and Hvergelmir, wellspring of cold, the source of many rivers. The tree was tended by the Norns (the fates), goddesses of the past, present and future. Yggdrasil was perpetually under attack by the evil serpent Nidhogg. The other worlds are those of other mytical creatures and the world of man, in the middle of the tree, between the roots and leafy branches. It seems we all drink from the wells of wisdom and fate and just one taste of the world of death. We all feel the sway of the goddesses of the past, present and future of fate. And our world rests in between the worlds that on principal we cannot (and perhaps shouldn’t) understand. Each of our lives span from the tree of life in ribbons, and everything is said to weave together in the shadow of the tree. Our strands do drift far from the tree, but in the end, we must find our way back to the tree to return whence we came. It has been awhile since I’ve heard this story, but I am still taken with the idea of the nine worlds and the tree. It’s nice (and silly :P) to picture us, Earth, the Milky Way and beyond, safe beneath the bark of the great ash tree. It’s nice that our actions fold into a great blanket. I mean, Yggdrasil’s interesting. But I can’t help feeling I’ve drifted far from the roots of the tree, blown by the high winds Norns, rulers of fate. I’ve drunk from the cup of wisdom and fate and a taste of the wellspring of cold and ended up in Connecticut (there goes the impressive ending to my story), a prick on the map with measly three-and-a-half million people. Yah. The winds of fate surely pick stellar locations to end up in. Ha! The winds are still blowing, and I’m paddling upwind and upstream to home. Hi Nicole! You may or may not remember me, I’m a friend from school Lisa Pommelet. If you don’t remember, thats totally fine becuase I remember you and all your awesomeness! There’s some great writing here! You should really put this inot a book or something! Anyway, you’re story here. The myth one, at the end you said you’re paddling upstream to get home! You’ll be here before you know it and we (me and our school buddies) are cheering you along the whole ride! I have to say I agree with Lisa concerning the book idea. With a bit of editing, the contents of the blog (which I’ve been reading for a while, just never posted :$) would make an excellent book. Sorry for posting without first introducing myself – I’m a friend of your cousin’s :). your ‘the’ adam? amy’s adam? i’ve heard about you! nice to meet cha! that would be me 🙂 i see that my reputation precedes me… hmmm. as for the meetings – likewise! You may not have a memory, Nicole, but your mind still works *really* well! I really enjoyed reading your text, which I find very creative and interesting! Actually, I just posted a photo of the tree that I think is the ash Yggdrasil. 🙂 It is situated in Old Uppsala, Sweden.